Staff, customers and local school children help open the store. Eager shoppers turned out for the grand opening of the new-look Lakes and Dales Co-operative store in Lazonby today (29 November 2013), following the recent merger between Penrith and Scotmid Co-operative Societies. Pupils from the Lazonby C of E School joined former staff member Jane Watt, who worked at the store for 30 years, at today’s store opening. The school was also presented with a cheque from Lakes and Dales Co-operative for £1,000 to help fund a technology upgrade. The Lazonby store has been refurbished inside and out, with a brand new design, features and services for customers. Local baker, Brysons of Keswick, will have a bakery counter inside the store, and customers will be able to enjoy a larger range of fresh fruit and vegetables, chilled food, craft beer and specialty wines. The store’s interior and exterior have also been modernised with a new black and green livery. 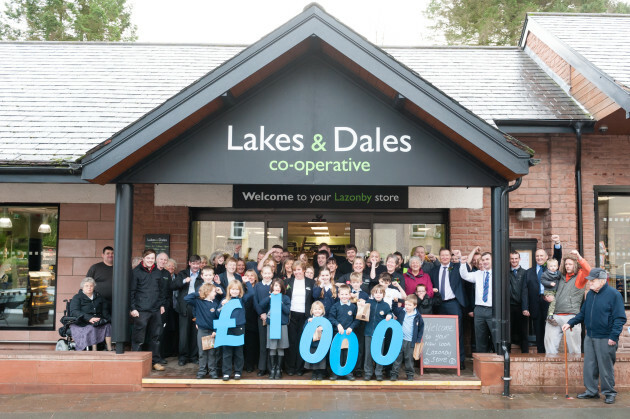 Lakes and Dales Co-operative has been selected as the new trading name for the nine Penrith Co-operative stores in the Eden Valley and Lake Districts in Cumbria, and the Weardale Valley in County Durham. Penrith Co-operative Society merged with the Scottish Midland Co-operative Society (Scotmid Co-operative) in August this year. The new-look Lazonby Lakes and Dales Co-operative is located at Henderson Buildings, Lazonby, Cumbria CA10 1BG and is open from 7.30am to 8pm Monday to Friday, 7.30am to 6pm on Saturday and 9am to 1pm on Sunday.